© 2019 Dilawri Group. Lease offer based on 2019 Metris Cargo(Stock #19864316). MSRP $36,000. *Total price of $40,426includes freight/PDI of $2,695, dealer admin fee of $595, air-conditioning levy of $100, PPSA up to $45.48 and a $25 fee covering EHF tires. **Additional Options, fees and taxes are extra. 1Lease example based on $399per month (excluding taxes)for 60 months. Lease APR of 1.99% applies to fleet rate on approved credit through Mercedes-Benz Financial Services. To be considered for fleet, deal must be a minimum of five vehicles or the purchaser must be part of the building supply industry association. Lease offer includes downpayment or equivalent trade of $5,000, plus first payment and applicable taxes are due at lease inception. Cost of borrowing is $2,456.Total obligation is $32,420. Lease offer only valid through Mercedes-Benz Financial Services.Certain limitations apply.Vehicle license, insurance, and registration are extra. Dealer may lease or finance for less. Offers may change without notice and cannot be combined with any other offers. 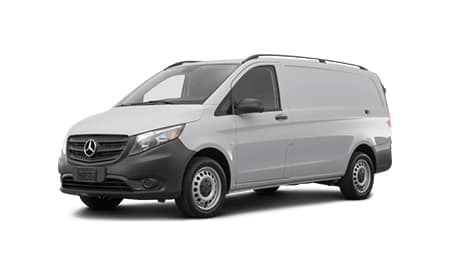 See your authorized Mercedes-Benz Boundary Van Centre for details or call the Mercedes-Benz Vans Sales Centre at 604-676-3778. Offer valid until April30, 2019. I consent to receiving electronic messages regarding new offers, exclusive invitations, promotions and other information concerning Mercedes-Benz products and services from Mercedes-Benz Boundary (3550 Lougheed Highway, Vancouver, BC V5M2A3). I can also UNSUBSCRIBE ANYTIME.